From August 25 to 26, 2018, the GNDEM Coordinating Committee, representing the nine regional networks, met in Colombo, Sri Lanka for the Sixth Implementation Meeting of the Declaration of Global Principles for Nonpartisan Election Observation. The Coordinating Committee discussed recent challenges and opportunities in citizen election observation, and further clarified and refined network priorities and standard operating procedures, including the approval of the first set of GNDEM Protocols. 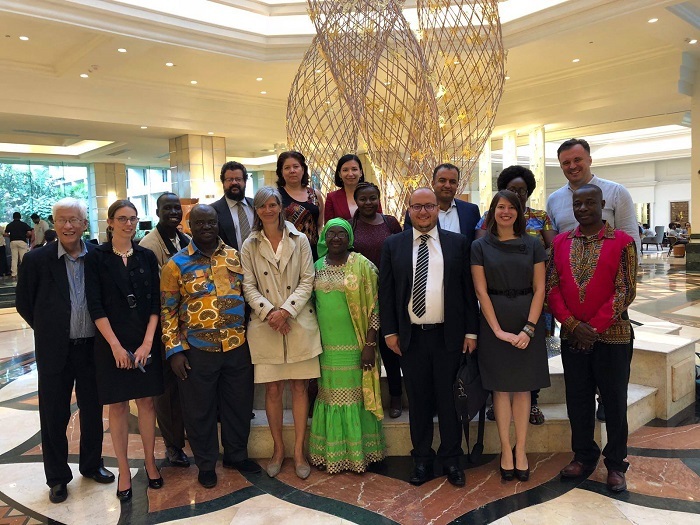 Following a meeting of the GNDEM Board, Coordinating Committee members participated in discussions and panels on topics relevant to GNDEM and election observation more broadly, including examples from their own organizations’ recent work in various thematic areas. A panel on inter-election activity followed which featured presentations by representatives from Acuerdo de Lima, ENEMO, and E-HORN. A representative from Acuerdo de Lima discussed the deteriorating communication environment in Latin America and how it has led to significant problems for the region including fake news, online manipulation, and hate speech. She discussed how Misión de Observación Electoral (MoE), a GNDEM member from Colombia, has been monitoring hate speech on social media and has been working to understand how stories evolve through social media and how people receive their information. A representative from ENEMO followed with a presentation on the lack of trust in electoral institutions in Montenegro, and how domestic and regional monitoring organizations like ENEMO and the Centre for Monitoring and Research (CeMI) are promoting transparency in electoral results. He also discussed their efforts to work with the EU to push for electoral reforms. A representative from E-HORN highlighted the role citizen observers can play in electoral justice. She discussed many of the topics observer organizations in Kenya engage in between elections, such as reforms to the constitution, the observation and preservation of human rights, and the right to access of information. Keeping election monitoring organizations relevant and sustainable during non-election years was a common concern among participants, some of whom encouraged GNDEM to prioritize taking more concrete steps in response to these common and growing challenges in the future. The group moved on to discuss a number of longer-term and pre-election initiatives to better meet emerging threats to democracy, including how to track, analyze, and combat disinformation in the electoral process, and how to plan for and implement an open election data advocacy, collection, and assessment effort. Participants from NDI and EPDE highlighted how open election data can be used to identify electoral manipulations, as well as the timing and feasibility considerations for obtaining and analyzing election data. The members identified possible sources for open data other than election management bodies (EMBs), including parliaments, statistics bureaus, and interior ministries. The use of disinformation to influence the electoral information environment was discussed in detail, as well as the growing prevalence of “zombie observers” and GONGOs undermining legitimate election observation. This was of particular concern to participants from European monitoring organizations. Participants discussed how to identify false citizen and international observation groups, and stressed the importance of monitoring the pre-election environment, and in particular, how groups could monitor disinformation or collaborate with other groups to include such analysis in their findings in order to build accountability around the threats. The group also discussed the potential for a GNDEM Election Observation Handbook to consolidate and present best practices among GNDEM member observer groups. They focused on the structure of the handbook and possible additions such as success stories, lessons learned, and infographics. The possibility of translations for such a handbook was also mentioned with several groups offering their own capacities and experience with this task. There was general consensus in regards to the purpose and overall intent of such a resource, as well as agreement to move forward in finalizing the structure and at least broad content over the coming year. The annual meeting also offered the opportunity for GNDEM representatives to reflect on the medium and long-term objectives of the network, and strengthen structural and organizational practices to meet the growing challenges of the citizen election observation community. The Coordinating Committee approved the first set of GNDEM Constitutional Protocols, which codify GNDEM’s membership and accreditation requirements as well as leadership and internal working group structures (to be distributed widely in the coming months). The Coordinating Committee also held elections for board positions, with Joe Keyrouz (ANDE, LADE) remaining in his position as Chair for the next two years and Carol Werunga (E-HORN, KHRC) remaining in her position as Deputy Chair for the next three years. The group discussed a plan to clarify and streamline the role of the Solidarity Working Group, including the process for issuing GNDEM solidarity statements in response to observer groups facing pressure or backlash from outside entities. They discussed the internal process of endorsement of statements as well as points of contact for statements and the review procedures. The group closed the final day by discussing the establishment of GNDEM awards, with proposed awards recognizing groups making significant contributions to observation methodology or democratic advancement. The proposal for such an award was adopted by the committee. Following the Implementation Meeting, GNDEM members took part in the Fourth Asian Electoral Stakeholder Forum (AESF IV), hosted by ANFREL, from August 27 to 28. After an opening keynote address by H.E. Maithripala Sirisena, the President of Sri Lanka, three plenary sessions were held. The first session featured updates from countries that have seen significant changes in electoral integrity. The second focused on trends of shrinking democratic space and emerging regional challenges. Highlights of the session included discussions on disinformation, best practices for the participation of minority groups and indigenous peoples, the progress towards achieving gender parity in elections, and access for people with disabilities. The last panel focused on how to foster credible electoral processes, including the role of civil society groups as agents of credible elections, financial regulations for campaigns, and the impact of information and communication technologies (ICTs) on electoral processes. The second day of AESF IV focused largely on topics specific to elections in Asian countries and featured discussions on contemporary challenges in Asian elections, civic education, and the protection of vulnerable populations.